Green Movement and online activist Mehdi Doulati Daraabad reported to Ward 350 to start serving his five years imprisonment sentence. Doulati Daraabad was arrested in a raid on his parents home by the Intelligence Ministry’s agents in February 2012 and was taken to the Intelligence Ministry’s Ward 209 in Evin prison. This activist spent 17 days in solitary confinement in Ward 209 and 17 days in Ward 240 (IRGC) under investigation and interrogation. He was released on bail in April of 2012. Ten months later, he was tried in Judge Moghayeseh’s court, and was sentenced to 3 years imprisonment on charges of “Assembly and Collusion, and Participation in the Post 2009 Presidential Election Street Protest”. He was also sentenced to 2 years on the charge of “Insulting the Leader”, giving him a total of 5 years imprisonment. Doulati Daraabad, a software engineer and a programmer reported to Evin on September 11 following the receipt of a summons from the Enforcement Branch of the Tehran Prosecutor. He was sent to Ward 350 to start serving his five years sentence. Music critic and researcher, Arvin Dedaghat-Kish reported to Evin to start serving his 3 years sentence. Sedaghat-Kish, the author of Faslnameh Mahvar and Shayda, and a writer for the now banned Culture and Music magazine, reported to Evin to start serving his sentence after learning his bail money was confiscated without notice. Sedaghat-Kish was arrested during the Ashura protests of 2009. He was kept in incarceration 62 days by the Intelligence Ministry. He was tried by Judge Salavati and sentenced to 3 years imprisonment on charges of “Assembly and Collusion with Intent to Act Against the National Security”. Green Movement activist Omid Shah Moradi was arrested last year and released on bail after 62 days of incarceration in Ward 209. After his release from prison, he was tried in the Revolutionary Court, presided by Judge Salavati and was sentenced to 3 years imprisonment on charges of “Assembly and Collusion by Participating in Street Protests”. After receiving a summons from the Enforcement Division, he reported to Evin and was admitted to Ward 350. Allameh Tabatabaei university student activist Arash Sadeghi was first arrested July 09, 2009, during the suppression of post-2009 presidential election events. He was released without being charged after 50 days in solitary confinement . Sadeghi was re-arrested December 2009 after the mass street protests of Ashura. He was later released on March 16, 2010. After his release, Sadeghi was informed by his lawyer, Mahmoud Alizadeh Tabatabaei, that Branch 26 of the Revolutionary Court, presided by Judge Pirabbasi, had sentenced him to 6 years imprisonment on charges of: “Propaganda against the establishment, and assembly and collusion with intent to act against the national security”. Arash did not report to Evin for the implementation of his sentence. For this reason, agents attempting to arrest him, raided his home on October 26, 2010 at 4:00 AM. The shock of this raid caused Arash’s mother to suffer a heat attack. She died four days later in the hospital. After this event, Arash Sadeghi reported to Evin on 21 December 2010. During this incarceration, according to eye witnesses that were his cellmates, Sadeghi was tortured severely, trying to force him to formally announce that the death of his mother had nothing to do with the 4:00 AM raid of their home. A year later, on December 14, 2011, Arash was released from prison. On January 5, 2012 the Green Voice of Freedom site reported the arrest again of Arash Sadeghi. Five days later, Saham News site reported that Arash had contacted his grandfather from Evin telling him he is in Ward 209. On May 4, 2012, independent reporter, Masih Alinejad conducted a phone interview which was published online. In this interview, Sadeghi’s father said that Arash’s grandfather had visited Arash at Ward 209 visiting room, and said he had lost a considerable weight and his head was shaved. According to Payman Aref, a number of families of political prisoners had attested to seeing Arash’s grandfather in the visiting room. On June 7, 2012 Arash’s grandfather was arrested after giving an interview to the press informing them that Arash had launched a hunger strike in support of political prisoner Hossein Ronagi. He was released after five days in detention. In June of 2013 reports came out that Arash had launched a hunger strike, in protest of being beaten by prison guards. After this news, Amnesty International and 3 of the European Union MPs released statements voicing concern over Arash Sadeghi’s situation. According to reports, Arash Sadeghi’s family has neither had a visit or a phone call from him since May 2012. This was the first time that a Judiciary official made any comment regarding Arash Sadeghi. After the comments by Ejee, two different opinions formed in the online community. One opinion believes that, based on this statement made by the Judiciary official, Arash is not in prison and his family must be asked abut his whereabouts. 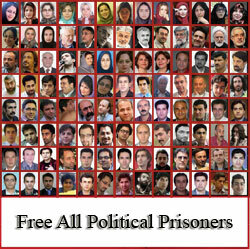 But former political prisoner Payman Aref who was in prison at the same time as Arash has a different version to tell. He told Deutsche Welle that, “The lower court had given Arash a six year imprisonment sentence, and his lawyer was informed of this sentence (not formally). Based on this Arash said he was sentenced to 6 years imprisonment. Arash finally reported to Evin December of 2010 after the death of his mother. Being under the impression that he was under a six year sentence, and due to the trauma of loosing his mother, was suffering from depression, and he did not request an appeal on his case. Based on the fact that he had no access to a phone, and his lawyer Mr, Tabatabaei did not come to visit him in prison, Arash was not aware of the Court of Appeals ruling in his case. The person who claimed to be Arash’s close friend has another reason for considering Arash’s story not to be true, and that is the news about his hunger strike and falling unconscious due to his hunger strike. Regarding this matter, Payman Aref said, “If he is talking about Arash’s hunger strike protesting the death of Haleh Sahabi, I do confirm that he was on hunger strike at the same time as I was. He even became very ill during his hunger strike and vomited all the content of his stomach right there in the middle of the Ward and there was nothing but fluid and there was no food particles in his vomit. Regarding his falling unconscious, I must say that was a certain political group’s plot to ruin the reputation of Arash. He told me to ask my wife to deny this news, which I did. If he has spread this false news about himself then he would have not asked me to deny the news on his behalf. The other point that the person claiming to be Aresh’s close friend makes, is about his release from prison in 2010. He says, “We were informed by one of the people who had been released from Ward 350 about Arash’s release date. That night and three other consecutive nights we were by Evin’s door waiting to congratulate Arash on his release. But on Friday when we were there waiting for his release we found out that Kaleme site had reported he had already been released. And here is Payman Aref’s account of Arash’s release in 2010: “I myself went to Evin to welcome Arash, I had myself informed all the people that had gathered in front of Evin. December 15, 2010 was the date that Arash was scheduled to be released. I myself was in Ward 350 of Evin with Arash from November 30, when I was arrested at the Behesht-e-Zahra cemetery until December 11, 2010. Four days prior to Arash’s release, I went to Court and subsequently was released that same night. After my release I informed everyone of Arash’s sentence having been reduced to one year imprisonment, and also gave the date of his release which was to be December 15 (four days after my release). December 15 was a Thursday. On that day, I and a number of other people went to Evin and waited for him but he was not released. Apparently, the night before his scheduled release date at 10:00 PM, in the cold of a December night they had released Arash. Because Arash’s father had distanced himself from him over the death of his mother, and also had changed his residence, Arash had no place to go and also did not have any money. He started walking on foot on Imam highway towards the south. He walked all night long so he would not freeze in the cold of the night. He then went to the Khaneh Honarmandan park (the Artists park), a place which held lots of memories for him. He was under the impression that his grandfather had also banished him. Finally, tired and hungry, he decided to try his luck at his grandfather’s home. Fortunately his grandfather welcomed him with open arms. Payman Aref stresses that, Arash was released on Wednesday December 14 at night time from Ward 350 and not from solitary confinement. With 200 political prisoners at Ward 350 wishing him farewell, there is absolutely no doubt about this matter. Arash Sadeghi’s father is in the military and lives in army provided housing. Previously speaking with the media, he said he had been summoned by the Army Intelligence many times and was threatened not to have any contact with Arash. Otherwise, he would be discharged from the military, his salary would be cut off and he would lose his housing privilege. Deutsche Welle’s efforts to contact Arash Sadeghi’s father and his former lawyer have been to no avail. After calling Arash Sadeghi’s father’s home for several days, a woman finally answered the phone. She first said that Arash’s father was out of town. Then she said that we are all out of town now and our phone has been redirected to the place where we are. Arash’s former lawyer Alizadeh Tabatabaei’s cell phone was turned off each time Deutsche Welle tried to contact him. Currently several campaigns have launched asking the question “Where is Arash”. Most of these campaigns are targeting the Iranian Intelligence and Judiciary system for answers considering their terrible history of kidnapping, arbitrary arrests and imprisonments. And yet another group continues to be of the opinion that Arash’s family must be held accountable for giving answers in this case. What is certain is that no one has seen Arash Sadeghi since May 2012. Following the denial of medical furlough for his son, Hossein Ronaghi’s father Ahmad Ronaghi is requesting help from UN Special Rapporteur, Ahmed Shaheed and the authorities in obtaining medical furlough for his son. According to the Human Rights News Agency, finally, on Tuesday September 10, Tehran’s Prosecutor General announced that he will not grant medical furlough to imprisoned blogger Hossein Ronaghi. Hossein Ronaghi was initially arrested December 2009. He was tried by Branch 15 of the Revolutionary Court and sentenced to 15 years imprisonment. PS: Jaras site (here) had reported previously that Akbar Amini is under pressure by the interrogators for the purpose of obtaining a false televised confession. 15 political prisoners incarcerated in Evin Ward 350 have written to Chief Judiciary Ayatollah Amoli Larijani voicing their concernm and warning him about the dire health condition of on-hunger strike political prisoner Hossein Ronaghi Maleki. Hossein Ronaghi was arrested on December 13, 2009, during the unrest that followed the disputed presidential election of 2009. His arrest and sentencing to 15 years imprisonment, were on charges of: Spreading Propaganda Against the Establishment, Insulting The Leader and the Head of the Government , and membership in the internet group (Iran Proxy). Ronaghi was also sentenced to an additional 2 1/2 years imprisonment for involvement in the Sarand camp earthquake volunteer workers’ case. One week after Ronaghi started his hunger strike his mother, Zokaikha Mousavi, also launched a hunger strike protesting the Judicial authorities neglecting her son’s situation. Along with the countless suffering that we are faced with in prison, recently, we are witnessing the gradual death of our cellmate, Hossein Ronaghi Maleki, whose candle of life is bit by bit melting down. He suffers from a multitude of illnesses. He has gone under 7 kidney operations during the 4 years that he has been imprisoned. Each time, his condition after the surgery was considered successful. But, due to his return back to prison, and the lack of facilities essential for his treatment in prison, he regressed back to pre-operative status, or even worse. Due to lack of in-prison treatment, and as the last resort available to him, he launched a hunger strike more than 25 days ago, which has aggravated his condition. On August 24, Hossein was taken to Hasheminejad hospital, where after examination by their physicians for his kidney problems, hospitalization was recommended. Also, on August 28, he was taken to Modares hospital with gastrointestinal problems. There also, after examination by doctors, immediate hospitalization was recommended. Despite objections by the doctors, the accompanying agents prevented his hospitalization and returned him back to prison. The result of the doctors’ examinations and recommendations from Hasheminejad hospital, along with his previous medical files, were sent to the medical examiners office. The medical examiners office forwarded their recommendation to the district attorney’s office on August 28. The medical examiners office has several times previously notified the district attorney’s office about Ronaghi’s grave health situation. But, despite his dire health condition and the dangerous worsening of his condition, the officials have made no attempt to hospitalize him. Instead of acting responsibly, they seem to be acting in spite of this patient. Once, the officials, in response to his complaint told him, and another time told his father that, at most, he will die in prison and, after few days of media noise, everything will end and become quiet. Unfortunately, this approach is from the people in an organization, under your management, that claim are enforcing Islamic laws and Divine justice. You are well aware that according to Sharia and legal regulatory requirements, and the Bureau Of The Prisons rules and regulations, medical treatment is an obvious right of an ill prisoner and providing it is the responsibility of the prison officials, the officials at the district attorney’s office and the Judiciary Branch, and delay in providing it has religious and legal liability. We give warning, serious warning, that the life of a man in Ward 350 is in danger, and with much worry and concern we announce that this warning letter may soon become a new witness statement. We strongly urge you, before it’s too late, and a human life is sacrificed for the ignorance and negligence of officials at the district attorney’s office, to act immediately, for tomorrow may be too late.